Podehole Landmark and Meonhill Lion King, champion and reserve in the Beef Shorthorns. 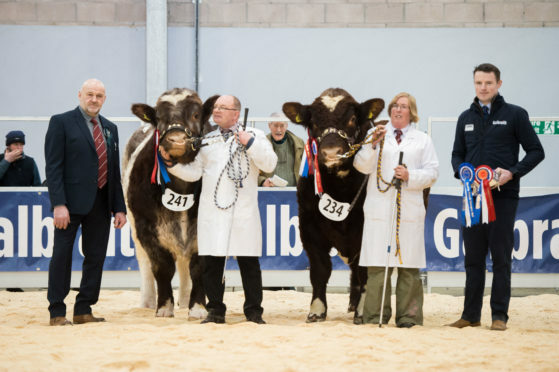 Peterborough breeders Harry, Charles and Sally Horrell dominated the Beef Shorthorn leaderboard, with both the junior and senior champions. The junior winner, Podehole Landmark, an April 2017 sire by Knockenjig Hercules, went on to win the supreme award. Podehole Lincoln, by the same sire and born just a month earlier, was the senior champion. In reserve supreme place was Meonhill Lion King, the intermediate champion bred by LEP Farms Ltd, Little West End Farm, Chidden, owned by Sid and Mary Chapman. The senior reserve champion was Leonard of Upsall from Hon G Turton of Upsall, Thrisk. He is a March 2019 bull, by Dingo of Upsall. The only Scottish breeder with a bull in the championship line-up was Donald Biggar, Grange, Castle Douglas. His reserve junior champion was Chapelton Lancer by Fergus of Upsall. The female champion was Glenisla Foxglove, from Major Gibb’s Glenisla herd at Blairgowrie. This April 2017-born in-calf heifer is a daughter of Chapelton Glen Clova. In reserve place was Mountbenger Lorna from JF Irving and Son, Selkirk.